Mi Young Lee, my good friend from college and a talented real estate broker had her very first listing up for an open house a couple of months ago. As much of an over-achiever as she is, she decided to take on everything including hand-selecting and purchasing furniture, and staging the place on her own with the help of our another uber talented friend, June. To make the open house day extra special and memorable, Mi Young and June planned the day out meticulously with food and beverages. And I wanted to help them out by making some desserts to go with June's homemade mini quiches. I wanted to make something delicious, easy to transport, something that people can walk by, quickly grab and pop in their mouths. So I decided to make lemon bars, s'mores cereal treats I made for Ethel and Brian's wedding (because you can never go wrong with them) and caramel popcorn with M&Ms to add some color to the table. These special lemon bars were made from freshly picked meyer lemons from our friends' backyard -- sweet and fragrant with just the right amount of tanginess. I just love how they look on a white plate with the bright yellow color! Other than the s'mores cereal treats, another recent obsession of mine has been making popcorn from scratch (not microwave). I love how you can be creative with flavors and the anticipation of seeing a pile of steamy white popped kernels when I open the pot lid gives me excitement. I simply tossed the freshly popped popcorns with homemade sea salt caramel, then baked them off in the oven to make them extra crunchy. Finally, Pretzel M&Ms -- my favorite -- were added for a pop of color. Along with other decorations, June made these adorable paper cones that were perfect for the popcorn. And as a huge fan of mason jars (they are so versatile), I had to include them in the decor so I made these name tags to go along with the desserts I made. Overall, I think June and I may have gone a touch overboard with the amount of food and decorations for an open house, but I absolutely loved being a part of it. Needless to say, the open house was a huge success with multiple offers and a final sale. With such a massive turnout and rave reviews on their first listing, I'm very excited to see where they goes from here. When my husband was at business school, his group of friends referred to themselves as APE. I won't say what it stands for (hint: it has to do something with being Asian and jobs) for various reasons, but their mascot naturally became Bathing Ape (Bape). So Ben, one of the founding members of Ape, and Wallis became proud parents of baby Grant in August, I wanted to bake a special cake for them and their newborn baby. As I was browsing through Google search results for Bape, I came across Baby Milo -- baby Bape character -- perfect for baby Grant's special cupcakes! I baked simple sugar cookie Milos decorated with dark chocolate. Thankfully, Milo's circular head shape enabled me to punch them out with round cookie cutters. Because one of my favorite things about summer is sweet, juicy stone fruits, I decided to make peaches and cream cupcakes. I whipped up a batch of peach jam filling with fresh peaches from the farmer's market and a touch of cinnamon and vanilla. Then the light vanilla chiffon cakes were hollowed out and generously filled with this peach jam. The cupcakes were topped off with fluffy vanilla cream cheese frosting and milo cookies. Look at the glowing couple! These cupcakes were for the parents and the guests to enjoy this time around, but hopefully I will get to bake Grant his first Cakes by Ji cake to enjoy in the near future! Congratulations Ben and Wallis! It's been way too long since I've posted on the blog. Lots have changed since. First off, I got married, went on a very adventurous honeymoon to Australia and New Zealand, a lot of my friends got married, successfully launched an amazing product with my wonderful team at work, moved out of SF into a new house in Burlingame that has two ovens (woohoo! ), and officially SCUBA certified. One thing that hasn't changes is that I still love baking. So when my friends Ethel and Brian graciously presented me with an opportunity to bake desserts for their wedding, I couldn't resist. This year's been quite tough with the big move and frequent business trips to Asia, but I knew it was time for me to step up. Their requests were 120 cupcakes with 3 different themes -- NY Giants (Brian's a fan), Cats (Ethel loves cats), and mustache (Brian's an avid follower of Mr. Money Mustache blog) -- and whoopie pies. But because whoopie pies are essentially two cupcake tops put together with frosting in between, I wanted to do something different. After surfing the web and browsing lots of different cookbooks (my favorite at the moment is Dahlia Bakery Cookbook), I decided on Peanut Butter Caramel Thumbprint Cookies and Coconut Macaroons. With this ambitious endeavor of making 3 different types of cupcakes and 2 desserts, I had to meticulously plan out the various components throughout the week of the wedding to keep the work load more manageable. Thankfully, all the components except for the cupcakes themselves could be made ahead of time. 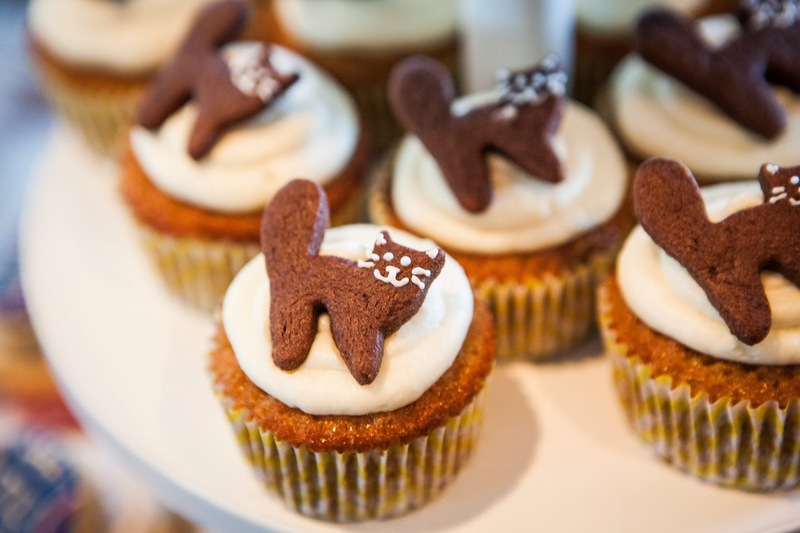 The cupcake toppers were made with simple vanilla and chocolate sugar cookies and decorated with frosting. I'm ashamed to say that I briefly considered taking the easy way out by using plastic cupcake decorations for NY Giants logo, but stayed strong and kept everything homemade and edible. Making the rest of the desserts went smoothly. These Coconut Macaroons made with the recipe from Dhalia Bakery Cookbook were perfectly nutty crunchy on the outside and gooey on the inside. The Peanut Butter Caramel Thumbprint cookies were not only pretty but absolutely delicious with wooey gooey peanut caramel at the center of a buttery cookie. (Thanks to my hubby who expertly whipped up the caramel!). As if I didn't have enough things to make, I decided to throw in a bonus dessert for them at the very last minute. I knew that they had decided against serving s'mores at the wedding due to logistics so I wanted to make a special treat that reminded them of it. I whipped up two batches of s'more cereal treats similar to Rice Krispie treats but made with Golden Graham cereal with chocolate. I topped it with some mini marshmallows and threw it under a broiler for to give it that nice toasty color and flavor. These are officially my favorite dessert now. Easy to make and crunchy, gooey, chocolatey, and absolutely delicious. The best part of making these for Ethel and Brian was that I got to eat all the scrap pieces afterwards. Teehee. I made three different types of cupcakes. 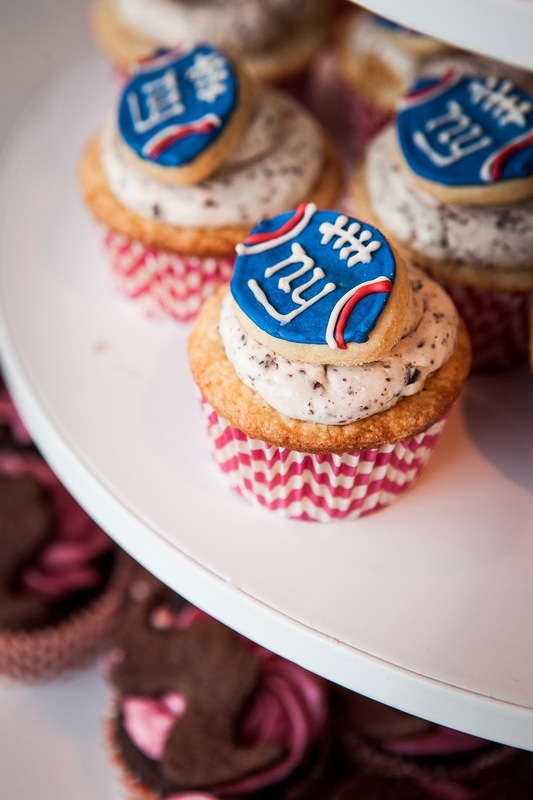 First, the NY Giants cupcakes are vanilla cupcakes with black cherry filling and dark chocolate flake buttercream. 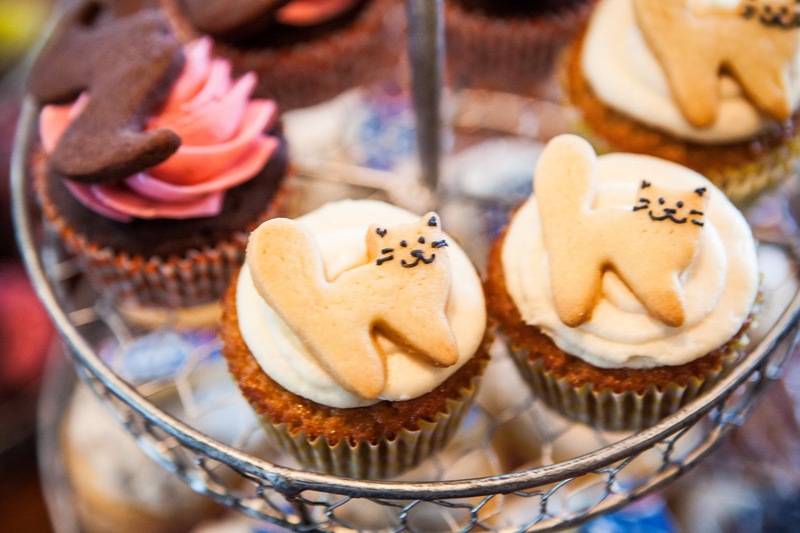 The cat cupcakes for the bride are spiced carrot cupcakes with brown butter cream cheese frosting. And lastly, the mustache cupcakes are decadent chocolate cupcake with raspberry buttercream. The day of the wedding, everything went perfectly. 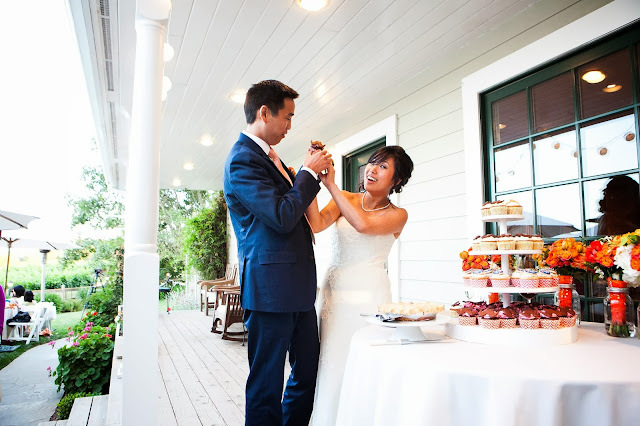 Stunning venue, beautiful weather, fabulous food, wonderful friends, and of course the adorable couple! 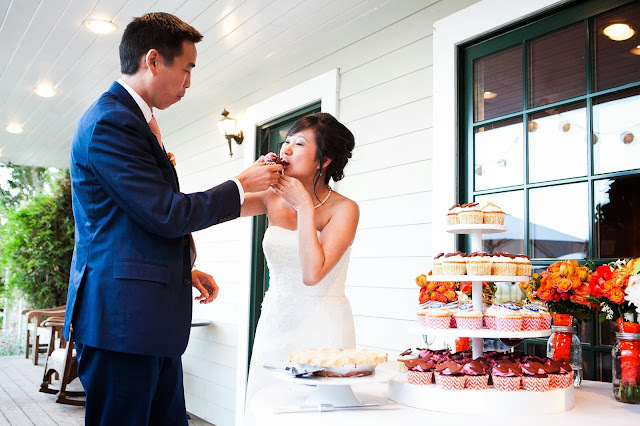 These stunning photographs of the couple are by Elle Jae Photography who also shot our wedding. Aren't they the cutest?